"The U.S. mission has not changed — the president has been clear that he wants U.S. forces to come home as quickly as possible," White House Press Secretary Sarah Sanders said. This past weekend was emblematic of the way the U.S. and much of the world have dealt with Assad since Syria's devastating civil war erupted in 2011: harsh criticism and occasional action, but no sustained effort that's come close to ousting him. Syria lies in ruins, yet Assad's security forces control most if it. The military threats to his rule are receding. Two key allies, Russia and Iran, remain determined to prop him up. Peace negotiations are going nowhere. For a host of reasons that vary by country, the players in the Syrian war appear willing to tolerate Assad because they're unable or unwilling to force him out. "We cannot purge the world of evil or act everywhere there is tyranny," Trump said in his televised remarks Friday. "No amount of American blood or treasure can produce lasting peace and security in the Middle East. It's a troubled place." 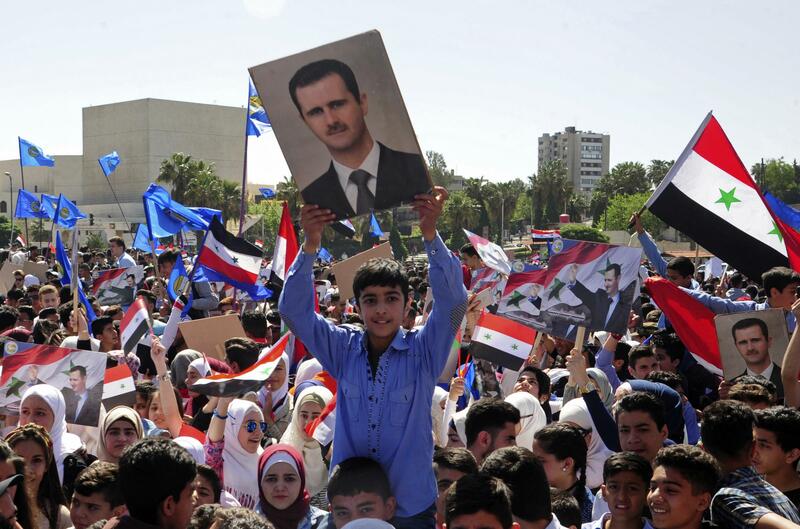 The U.S. and other opponents of Assad have always been reluctant to openly say that an Assad victory may be the least bad alternative in Syria. But through their actions, that's where the trend lines are pointing. Israel's concern is more with Iran than Assad. Turkey's President Recep Tayyip Erdogan applauded the U.S.-led airstrike against Syria, saying, "The innocent Syrian people should have been defended long ago." Erdogan and others, including the U.S., began calling for Assad's ouster shortly after the war began, and Turkey has absorbed more than 3 million Syrian refugees, more than any other country. Yet one of Turkey's biggest security concerns is the Kurdish fighters in northern Syria, along the Turkish border. Turkish troops have even entered this area to create a buffer zone. The Syrian Kurds are closely allied with the U.S. Yet Turkey regards them as terrorists and fears they are working with Turkey's own restive Kurds. The drama surrounding the U.S.-led airstrike in Syria briefly created the impression of a change in the status quo. But it ultimately revealed yet again that Assad's opponents are only willing or able to go so far, and are not prepared to take actions that would force him out.